Set of 6 glasses that together form a Saguaro cactus. Retro aperitif set consisting of 4 dishes and one holder for aperitif sticks. Stacked they form a wine bottle. Brighten up your daily life and drink water or other fresh drinks out of this pleasantly disturbed set of 4 stackable glasses in the shape of a koifish. Also great to give as a present and to provoke a guaranteed 'WOW'. Available in various colours. Brighten up your daily life and pour water or other fresh drinks out of this pleasantly disturbed carafe in the shape of a cockatoo. Also great to give as a present and to provoke a guaranteed 'WOW'. Available in various colours. Set of 3 stackable bowls for serving all kinds of tasty appetizers, nuts, fruits, cookies,... Together they form an 'antique' jar made of terracotta. Only for foodies! Two mills in the form of a cactus. One for pepper and one for salt. Together they form an irresistibly cool set that immediately catches the eye both at the table and in the kitchen. 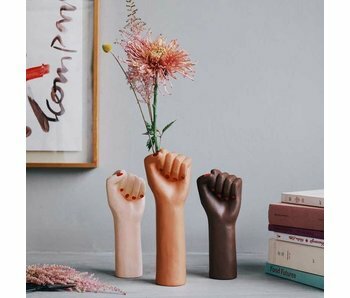 Ceramic vase for the contemporary woman who knows what real Girl Power stands for. A statement in itself, but even more so in the complete set of three: brown, black and white. Show that you care about female empowerment! Decorative liquor decanter with a glass skull inside. Content: 1 liter.